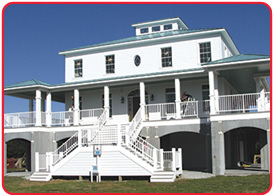 STRONGRAIL® Architectural Handrail Incorporated Into Hurricane-Proof Homes! 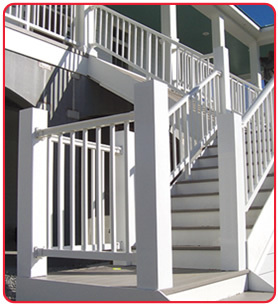 A hurricane resistant model home on Topsail Island in North Carolina has been fitted with Strongwell’s new architectural handrail system, STRONGRAIL®. The home was designed by 1st Class Homes NC, with the help of three engineering firms, to withstand hurricane force wind to Category 4 (140 MPH). 1st Class Homes selected STRONGRAIL® because of fiberglass handrail’s engineered wind-load strength, durability of finish and attractive appeal to homeowners, designers and builders. Potential customers can purchase the entire home package from 1st Class Homes or may select STRONGRAIL® to renovate and upgrade existing homes, docks, piers, condominiums and commercial structures. The low-maintenance STRONGRAIL® handrail is cost-competitive with traditional railing materials. STRONGRAIL® is a better choice than PVC, which has no comparable strength or durability to fiberglass and degrades rapidly in coastal environments. When compared to lumber, the high quality pultruded shapes that comprise STRONGRAIL® will not splinter, stain, warp or require repainting for the next 10 years or longer. Advantages over competing aluminum and steel systems include resistance to oxidation, discoloration and pitting. In the highly corrosive salt-water environment, STRONGRAIL®, with molded-in color, will outlast aluminum and steel systems with virtually no maintenance.